Splash around all day in famous Big Kahuna Water Park. See the website for information and schedule of open times. In the heart of Destin! Climb aboard Destin�s ORIGINAL Sea Blaster for a fun and exciting cruise with Capt. Larry who has been entertaining families in the Destin area since 1995. Join the fun and come search the Emerald Green waters of the Gulf of Mexico along the sugar white sand beaches of Destin, Florida, for the most playful dolphins. HarborWalk Village offers activities and entertainment to please each and every taste in your family. Dive in and make memories that will last a lifetime. Here you can find waterfront shopping, paddle board and kayak rentals, pontoon and jet ski rentals, parasailing, glass bottom boats, world class fishing, pirate ship excursions, dolphin cruises, clubs and nightlife, weekly fireworks, weekly Fat Tuesday parades, live entertainment, and an array of restaurants to satisfy all tastes. Located along the shores of the Choctawhatchee Bay in Northwest Florida, The Village of Baytowne Wharf features an array of boutiques, eateries, galleries and nightlife -- not to mention a jam-packed schedule of outdoor festivals and special events for the entire family. 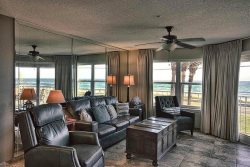 This spectacular setting, all within the gates of Sandestin Golf and Beach Resort, is the perfect spot to spend a vibrant afternoon, evening, week, or vacation.